During the month of February 2019, Wesbury residents, staff and volunteers gave 144.5 hours of service through various public engagement-community involvement opportunities. Thank you for your time and service to the community! 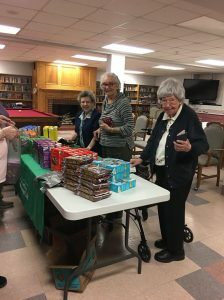 Residents bagged cookies for Girl Scouts, clipped coupons for troops, made a game for residents in another nursing care facility and participated in the Mealtime with Mentor program. Wesbury staff participated in chili cook offs for the Conneaut Lake Revitalization Committee and Taylor Hose Service Club, served on MMC (hospital) Board and committees, CCYSA (Soccer) Board, CATA (transportation) Board, Meadville Public Library board, Meadville Ministerial Association, Meadville Area Recreation Complex (MARC), Crawford County ARC board and Business and Professional Women. Wesbury staff hosted an Estate Planning event, a Healthy Living Speaker Series, and our facility is used for several community group meetings including Rotary and Rotary Board, Golden Kiwanis, Lions Club, Roundtable, Barbershoppers, Eastern Star, Relay for Life and Gideons. Body Recall and a Zumba class (fitness groups) also use our facility for their programs. Wesbury staff are Sunday School teachers, Scout leaders, they visit hospital and hospice patients, conduct funerals, and help with community events.